Indium Corporation announces the release of its newest technology publication, SMT with Phil Zarrow, authored by SMT expert Phil Zarrow, President and Principal Consultant for ITM Consulting. SMT with Phil Zarrow details the materials, processes, and techniques that optimize circuit board fabrication and assembly using through-hole and surface mount technology (SMT). Topics range from solder alloys, solder pastes, solder preforms and fluxes, to equipment selection and settings, and process techniques. Standard materials and processes are covered, as well as specialty techniques involving low- and high-melting solder alloys, step-soldering, thermal interface materials, solder preforms, flux-coated solder preforms, indium alloys, and much more. Zarrow hopes his blog will provide helpful information to the SMT industry. 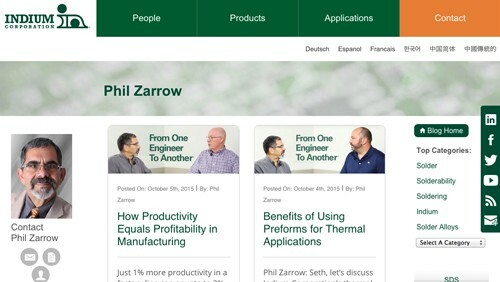 “The goal of my blog is to share the expertise of materials, equipment, and process designers and practitioners to help users optimize their profits, quality, and yields,” Zarrow said. Dr. Ron Lasky, Senior Technologist at Indium Corporation, Professor of Engineering and Director of the Cook Engineering Design Center at Dartmouth College, regards the blog as a useful industry resource. Consisting of video interviews and transcribed text, this publication can be found at www.indium.com/blog/phil-zarrow. Zarrow has been involved with PCB fabrication and assembly for more than 35 years. In addition to his background in automated assembly and cleaning, Zarrow is recognized for his expertise in surface mount reflow soldering technology and in the design and implementation of SMT placement equipment and reflow soldering systems. His extensive hands-on experience also includes set-up and troubleshooting through-hole, and SMT processes throughout the world.